StarClan is the home of the spirits of all cats' warrior ancestors. As each cat dies, they are visited by a member of StarClan, usually a cat they have known before, and taken to join starbound warriors. Clan Character: Battle-hungry, aggressive, ambitious, and greedy for territory. It is said that the cold wind that blows across the ShadowClan territory chills their hearts and makes them suspicious and untrusting. Clan Character: Contented, sleek, well fed. Long fur and glossy coats. They love beautiful things and often collect rocks, shells, and feathers for their dens. They do not fear water. Prey: Mainly fish but also water voles, shrews, and mice. Clan Character: Fiercely loyal, tough, fast-running, and easily offended cats. They are nervous and quick to flee, due to the lack of cover on the open moor. Clan Character: In peace, respectful of other Clans. In battle, fierce, courageous, and loyal. 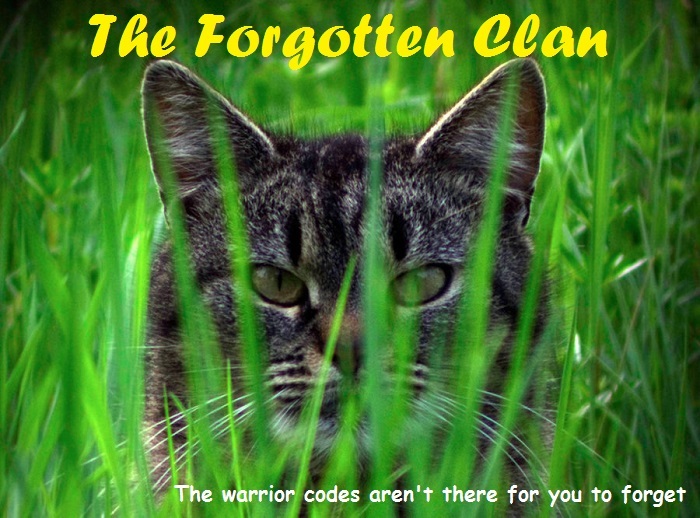 ThunderClan cats speak out for what is right and are not afraid to challenge the warrior code. Prey: Mice, voles, squirrels, the occasional rabbit, and birds such as starlings, magpies, wood pigeons, and thrushes. "Let all cats old enough to catch their own prey gather under the _________ for a Clan meeting." "The time has come to appoint a new deputy. I say these words before StarClan that the spirits of our ancestors may hear and approve my choice. __________ will be the new deputy."